The Galaxy Watch’s recent software update has brought an important change for the watch’s sleep tracking feature. The Galaxy Watch can now track REM sleep at night without needing continuous heart rate monitoring. Before the last update, REM sleep data was only recorded when the watch was set to always monitor heart rate. That dependency of REM sleep tracking on heart rate monitoring has now been removed. 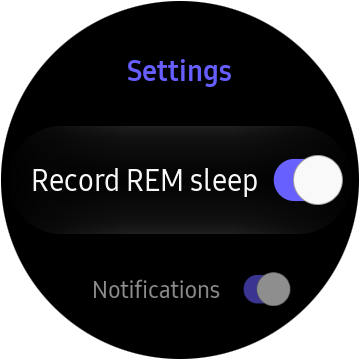 The Galaxy Watch also has a separate toggle for enabling or disabling REM sleep recording with the latest update. Continuous heart rate monitoring will probably give you a better idea of how much REM sleep you’re getting each night, because the heart beats faster during REM sleep. But having heart rate monitoring set to frequent (which measures heart rate every ten minutes) will mean reduced battery usage overnight, even though it might be at the expense of the accuracy of REM sleep tracking. To access the REM sleep recording toggle, scroll to and tap the sleep tracking widget on the watch, then tap the three-dot button on the right and tap the Settings option. REM sleep tracking will be enabled by default once the Galaxy Watch update is installed, but you can disable it using the toggle if you wish. It’s all made up numbers anyway. If you really think these watches can really detected when you’re in your REM-phase, you need your head examined.